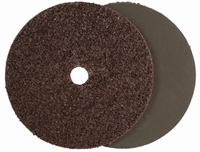 Applications: When the finished surface is important, these fibre backed surface conditioning discs are ideal as they have multiple uses: clean, de-grease, remove weld splatter, de-burr and leave a blended, conditioned surface finish. Use a flexible back-up pad for controlled stock removal and a fine finish. Select from coarse (FE1 or RC1), medium (RC2) depending on the finish required. Product Notes: Surface conditioning material (SCM) is an non-woven open nylon structure impregnated with resin and aluminium oxide abrasive grain. The open structure resists loading whlist its flexibility results in fine surface finishes. The coarse grade finish is equivalent to approximately 100 grade, depending on how it is used. Similarly, medium and fine are approximately equivalent to 150 and 320 respectively. They can be used on standard fixed speed angle grinders but will give optimum performance and life at lower speeds on a variable speed grinder or polisher, especially when fine finishing. Also Available: We stock flexible backing pads to get the best results from these discs.